This unit is a Water to Air Heat Exchanger for use in your hot air plenum of your existing forced air furnace. 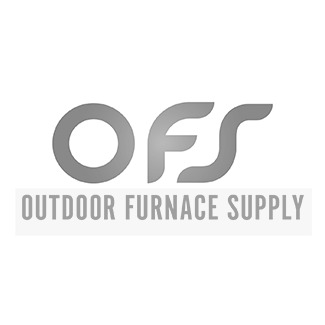 This unit is most commonly used in conjuction with an outside wood furnace to transfer heat into your existing forced air system. It can also be used with any other source of hot water such as a boiler to create hot air. This exchanger is for use with ANY outdoor wood stove. And also features quality aluminum fins with seamless copper tubes. Our coils are packaged the best possible way to minimize shipping damage. The coils fit snuggly in the boxes to minimize movement within the box. There are strips of styrofoam all the way around the manifold to prevent damage if dropped. The entire coil is packaged in a double wall, cardboard box. These are also packaged with metal port protectors over the inlet/outlet ports to protect them from shipping damage. Finned Area: 16" x 16"
We do our best to offer a high quality product that will not be damaged during shipping and you will not have to return due to manufacturers defects such as leaking. We stand behind the exchangers with a LIMITED LIFETIME WARRANTY AGAINST MANUFACTURERS DEFECTS. A free copy of the written warranty is available upon request to our email address.